A big thank you to Heaven Hill for still being one of the only distilleries left that had not realized I had stopped blogging. Thanks to a few samples, I’m writing again! Let’s get it going! The 12th edition of the very popular Parker’s Heritage Collection this year features bourbon finished in Orange Curacao Barrels. I don’t think I have ever seen or used an Orange Curacao bottle, but I remember when Blue Curacao was really popular and more so in Atlanta because the Braves outfielder Andruw Jones was from Curacao. I also know that Willett did an experimental release called Willett XCF in which they also finished bourbon in orange curacao barrels. 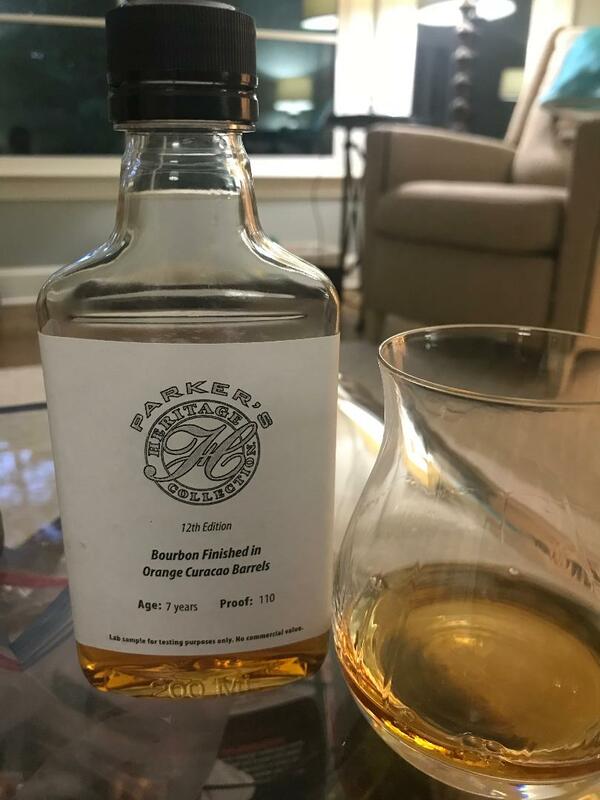 According to Heaven Hill, the bourbon in this release was aged in the Upper Floors of Warehouse Q before being finished for 4 months in Orange Curacao barrels. It was also bottled at 110 proof this year and was non-chill filtered. It smells like orange and butter. Like butter that was made with oranges. Maybe I could call this orange marmalade, even though I’ve never actually had that. There is still some bourbon there on the nose and it did burn my nostrils a little at the 110 proof, but there is definitely a tropical, this-is-not-bourbon nose to it. The first time I tried it and my friend Chuck tried it, we thought the same thing, that it didn’t taste like a bourbon. Although it starts out with a strong flavor of mint and caramel, it quickly gets replaced by an orange zest flavor on the finish. The finish is decent, not offensive, but it does lack the caramel and vanilla finish that I love with bourbon. I have tried it a few more times and it’s about the same. It’s different, but I can’t say that it’s bad. It’s one of the more unique barrel-finished bourbons that I have had. And at $89 retail, you are going to buy it anyway. Just don’t expect it to taste like boubon, because it doesn’t. But if variety is the spice of life, then I guess this can be added to your collection. Coming later this week – review of the Fall release of Old Fitz and the 27 year Heaven Hill release.